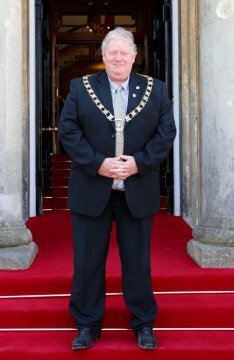 The President of Salisbury and District Chamber of Commerce & Industry, Andy Rhind-Tutt, attended the City of Salisbury Mayor Making Service on Saturday 14th May, 2016. This annual Ceremony is the official handover of the Mayoral Chain of office and this year it passed from Cllr Andrew Roberts to Cllr Derek Brown OBE who became the 756th Worshipful Mayor of the City of Salisbury. Over 200 Civic Dignitaries and guests, including Mayors from neighbouring towns and cities as well as the Mayors of Salisbury’s twin cities of Saintes and Xanten were present. President Andy proudly represented our members of Salisbury and Districts business community, congratulated the new Mayor on his inauguration and is looking forward to working closely with the City Council to provide a collective voice from our businesses to help steer the regeneration of Salisbury over the coming years.